Utility Stress cards contain a stressing compound embedded in the core PVC material which allows the card to be easily embossed. When a card is embossed, the raised letters (stress-white) for readability. Available in Hospital Blue, Green, Red & Cranberry Polish/Matte Finish. 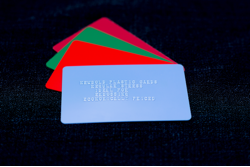 During the hospital registration or admissions, a blank plastic card is embossed with various patient data to produce a Patient ID card. Using an imprinter, the card information is transferred (via ink roller) onto forms in medical record/patient chart. For information on Addressograph card system products, including the Model 610 Plastic Card Embosser and Model 2000 Series Plastic Card Imprinters, click here.